In Gaza, Explosive Remnants of War (ERW) and other explosive hazards resulting from the 2014 and previous hostilities continue to pose a serious threat to the life and physical integrity of the population. The extent of contamination by ERW in Gaza is unknown. Although a large number of ERW was cleared shortly after the 2014 conflict by both official and unofficial bodies, suspected ERW remain hidden throughout Gaza, either among the rubble of destroyed structures or buried below the surface. Since the end of hostilities in August 2014, 17 people have been killed and 100 more have been injured by ERW, including 46 children. As part of a sustainable strategy to mitigate the risks posed by ERW, the UN Mine Action Service (UNMAS) focuses on protection measures which include the continued removal of suspected ERW, and support for reconstruction and development efforts by providing a holistic framework of risk mitigation measures. These measures comprise four mutually-reinforcing components, beginning with site-specific ERW risk assessments to determine the hazards and the level of risk. Based on these assessments, ERW risk awareness training is then provided to construction workers. UNMAS monitors ongoing work activities to ensure compliance with recommended measures. The final component is responsive technical support from an Explosive Ordnance Disposal (EOD) expert whenever an item is suspected to be an ERW. These activities are complemented by providing ERW risk education to communities at risk in order to reduce the number of accidents. Following the end of hostilities, UNMAS supported UNDP’s Rubble Removal project for the safe removal and processing of more than one million tonnes of rubble. By the end of July this year, 81 risk assessments had been provided in support of reconstruction efforts coordinated by UNDP; the areas surveyed totalled 405,000m2 of land, including 41 km of roadways. ERW risk awareness training has been provided to 211 workers and risk education sessions have reached almost 39,000 members of communities at risk, including boys and girls. In parallel, UNMAS continues to provide UNRWA, other UN agencies and NGO partners with leadership and expert technical expertise on the management of explosive hazards, while developing contingency plans to strengthen emergency preparedness. The ERW risk mitigation measures deployed in Gaza constitute a responsible and sustainable response to identify and remove ERW, and ultimately protect the lives of civilians. 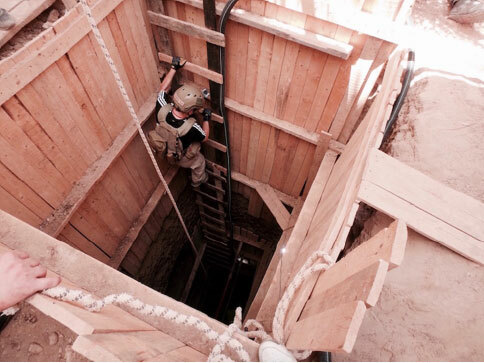 On a hot summer day in July 2016, a bomb expert from UNMAS lowered himself down an excavation shaft 12 metres underground in a busy neighbourhood in the Middle Gaza Area to defuse a 925 kg aerial bomb, part of the legacy of past conflicts in Gaza. Although the responsibility for ERW clearance lies with the Gaza police, the impact of large aerial bombs cannot be properly managed in Gaza due to a lack of the technical skills required to render such items safe. UNMAS was therefore requested by the Ministry of Interior to fill this gap and assist with the clearance of aerial bombs. In this case, the bomb was safely removed and destroyed. For the UNMAS technician, the safe completion of this task brought with it the satisfaction of knowing that the danger had been removed forever. For the landowner, the removal of the ERW allowed him to close a painful chapter and to start the process of rebuilding his property. When a bomb expert defuses a large bomb buried deep underground in a civilian area in Gaza, it is on the understanding that this work is only one essential component of a collaborative and holistic approach to protect civilians from the risk posed by ERW. Among other activities, since the end of the 2014 hostilities, UNMAS has cleared more than 40 cases of suspected large aerial bombs posing a risk to communities and impeding reconstruction and development efforts. Of the 131 locations identified since 2014 where this type of aerial bomb is suspected, 87 sites remain to be cleared. Each case can takes weeks to conclude and requires a costly combination of workers and heavy machinery. The availability of funding is a therefore a limiting factor to the speedy clearance of ERW that remain buried.